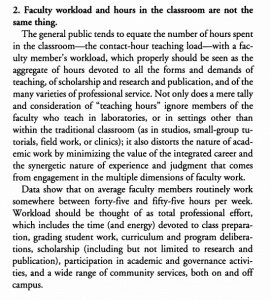 Phillip W. Magness » Do Adjuncts and Full Time Faculty have similar work loads? Historically, adjunct faculty positions emerged as a part time job. The most common example of this practice was designed to allow working professionals to take on a class or two in a university setting. Students benefited from moonlighting instructors who were also practitioners with experience in relevant fields, or perhaps even faculty from different departments or universities who could take on an additional class and add some interdisciplinary perspective. In another common use, adjuncting allowed graduate students to gain teaching experience (usually with intro level courses) while they prepared for the job market or finished their dissertations. Both functions are still very common in academia, with working professionals comprising roughly a quarter of all adjuncts and grad student ABDs making up perhaps another 5-10%. These traditional functions stand out in contrast with what might be called the “professional adjunct” – instructors who piece together the equivalent of a full-time course load through multiple adjuncting jobs. The vast majority of these teach at only one or two universities, though a very small number of so-called “freeway flyers” have been known to combine work from three or more different universities into a 4+ course load per semester. Most of the adjunct labor union movement centers upon this latter category of “professional adjuncts” and one of its most frequent claims is that persons who teach these course loads are “underpaid” relative to the work they perform. Some of the more extreme activist narratives go so far as to claim that full time faculty are offloading their teaching obligations onto underpaid adjuncts, even as they extract significantly higher full time salaries. This assertion chafes with extensive research showing that most full time faculty spend the largest part of their work week teaching, yet it also hints at a self-perception among “professional adjuncts” that they are carrying a workload that is at least equal to that of a typical full time professor. This is an empirical claim, making it testable against actual data. So how does it hold up? All three of these functions are typically part of a full time faculty member’s employment contract, and all usually weigh into tenure and promotion decisions though with some differentiation on how much they are emphasized. The division of time between the three areas also varies by institution type. Faculty at R1 research universities will typically spend more time on research and less in the classroom. Faculty at liberal arts colleges spend more time in the classroom than conducting research, though some research is usually necessary for promotion. Faculty at community colleges spend almost all of their time in the classroom and are only expected to do a small amount of research. Note that adjuncts, by comparison, are contracted almost exclusively for the classroom part of the first category: teaching. Most adjuncts are not expected to formally advise students beyond classroom instruction. They usually have no research expectations for promotion or contract renewal. And most adjuncts are not expected to fulfill service requirements at either the departmental or university level. Briefly summarized: full time faculty are contracted to (1) teach, (2) research, and (3) provide university service. Most adjuncts are only contracted to teach. As our comparison already shows, full time faculty have significantly more employment expectations than adjunct faculty who are only contracted for the classroom part of the job (note that this does not mean adjuncts conduct no research. Rather, they do so on their own time as it is not an official part of their employment terms). A 2014 study of a panel of 30 tenure track and tenured faculty at one research university (Boise State) found that teaching actually consumes the single largest portion of the typical full time professor’s work week. The average participant actually spent 24.5 hours/week on teaching. Since research is often done on Saturday and Sunday, this makes up about 40% of their overall work hours when weekends are also included. It’s also the equivalent of about 60% of their standard Monday-through-Friday 40 hour work week. This finding is consistent with other research on the subject. In 2003, the US Department of Education conducted an extensive survey of faculty workloads. They found that the average full time faculty member (any institution type) spends about 58% of his/her work week on teaching. The number drops to 43% for faculty at research universities. Liberal arts college faculty spend about 66% of their time on teaching. These data compare closely to an earlier 1987 survey by the Department of Education. As reported in a 1994 study by the AAUP (unfortunately its most recent comprehensive look at the question), the 1987 results showed that the average full time professor devoted about 56% of his/her work week to teaching. The lowest was 40% at private research universities. Liberal arts college faculty averaged 65%. So the data changed very little between 1987 and 2003. And those earlier findings are consistent with the 2014 Boise State panel study. Using these reference benchmarks, let’s estimate that the average full time faculty member spends between 56-60% of his/her time on teaching. The Department of Education studies also estimate the total working hours of a typical faculty member, as does the Boise State study. The 2003 USDOE report found that the average full time faculty works about 53 hours per week. The Boise State study showed a 54.4 hour total work week. This translates into 31 hours/week in the classroom on average. The low ball number for research universities translates into about 24 hours of teaching/week (roughly the same as the Boise State study). Liberal arts faculty spend about 35.5 hours/week on teaching. Service consistently takes up a little over 20% of the typical full time faculty member’s time regardless of institution type. And research ranges from a little over 30% at research-intensive universities to a little over 10% at teaching-intensive institutions (excluding community colleges, where research is only 4% of the work week). Recall that a common complaint among “professional adjuncts” is that they work the equivalent of a full-time faculty position, but for pay that is well below the entry level full time faculty median salary of about $48,000. We’ve already established that most adjuncts in this category have very minimal research or service obligations as they are only contracted for their classroom instruction. The aforementioned U.S. Department of Education study also examined adjunct work divisions and found that teaching comprises about 88.3% of the average adjunct’s work week. Adjunct work hours may therefore be compared directly to the teaching component of full time faculty. These data also put the average adjunct’s teaching load a good 9 hours short of the average full time faculty member at a doctoral institution (24 hours/week). It is also less than half of the workload of a full time faculty member at a teaching-intensive institution such as a liberal arts college (35.5 hours/week) or even the general average of the U.S. university system (31 hours/week). But perhaps I’m cutting the adjuncts a little short on my estimates. In that case, we might generously assume that our “professional adjunct” is one of the minority of adjuncts who teach at two or more universities. Let’s assume this adjunct teaches a 4-4, split between two universities, and therefore doubles the hours worked to 30/week. This still puts us only 6 hours more than the average teaching load for a full time faculty member at a research university, just under parity with the national average for all full time faculty, and 5.5 hours short of the liberal arts college average. In other words, a “professional adjunct” with a 4-4 course load split between two different campuses is likely working weekly hours that are somewhere in the neighborhood of only the teaching component of a typical full time faculty member at the same college or university. Most adjuncts are working significantly fewer teaching hours than full time faculty at the same institutions. And those same adjuncts have almost none of the research and service obligations that full time faculty must contractually perform. Using the same Department of Education data, research plus service easily adds another 20 hours/week to the typical full time faculty member’s work expectations on top of their teaching. Those 20 hours are in addition to what even our 30 hour/week adjunct spends in the classroom. But why stop there? Let’s imagine a severe scenario involving a teacher that we will call Super-Adjunct. Super-Adjunct comes from the extreme upper tail of the adjunct workforce – and indeed the extreme upper tail of the tiny 4.2% of all adjuncts who are true “freeway flyers” and spend time at 3 or more campuses. Super-Adjunct teaches 6 full three-credit-hour courses a semester. This means Super-Adjunct spends 18 hours/week just standing in front of a classroom. Let’s assume our hypothetical extreme adjunct has an average efficiency at grading and prepping for class. After all, Super-Adjunct is Super-Adjunct. And Super-Adjunct spends 5 hours out of the classroom per week for every one of the 6 classes being taught. That’s 30 hours/week on grading and prepping and answering emails and caring about students. 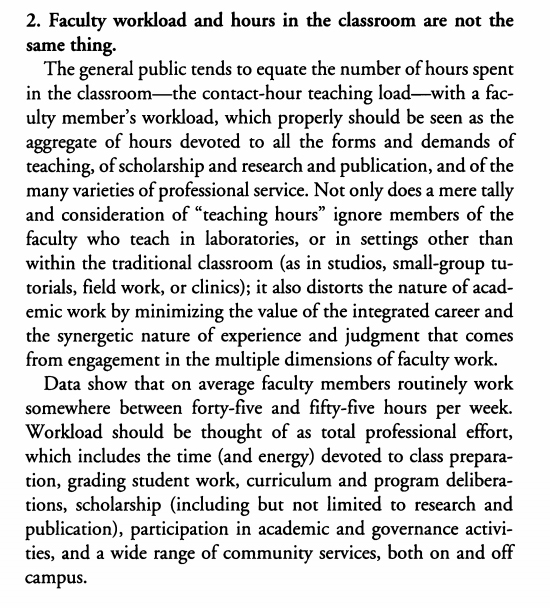 Super-Adjunct’s total work load is now 48 hours/week…or still 5 hours short of the average full time university faculty member, inclusive of the latter’s research and service obligations. Super-Adjunct may indeed be working more than a standard 9-5 full time job (albeit for only 30 weeks out of the year, as opposed to 50 for the 9-5er). But not even Super-Adjunct is putting in hours that match just the national average for a typical full time college professor. Those hours, by the way, are even higher for full time faculty at research institutions. But most “professional adjuncts” are not Super-Adjunct. They’re actually putting in somewhere around the 30 hour/week level at the upper end, and probably lower considering that the Coalition on the Academic Workforce reports that less than a third of all adjuncts teach more than 2 courses per semester. The results of our examination of the “professional adjunct” empirical claim are conclusive: even an adjunct with a heavy teaching load falls well short of the average work hours of a typical full time faculty member once the latter’s service and research obligations are included. A “professional adjunct” would have to be teaching somewhere in the neighborhood of 30 hours/week to simply maintain a teaching portfolio on par with the average full time professor, and that would include none of the additional obligations of research and service. And most adjuncts have teaching obligations that fall far short of 30 hours/week. Furthermore, most adjuncts would not be competitive applicants for the average teaching job as that average includes research university positions. Multiple points of evidence indicate that the typical “professional adjunct” has a comparatively weak research portfolio, and a subset of the activist ones even hold the entire peer review process in open contempt. Assuming they could even get a full time job it would likely be a teaching-intensive job, and therefore closer to 35 hours/week. In effect, this means that the “professional adjunct” activists who claim they deserve salary parity with full time faculty are actually demanding “equal pay” for severely unequal and lesser amounts of completed work. It would appear that the “professional adjunct” activists have appropriated this same mistaken belief as their own. 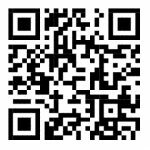 This entry was posted by Phillip W. Magness on Monday, March 28th, 2016 at 10:00 pm	and is filed under Uncategorized. You can follow any responses to this entry through the RSS 2.0 feed. Both comments and pings are currently closed.